And enjoy a convenient drop off at the city center after your visit to Kuang Si Waterfalls! Very straightforward and worth it. Beautiful scenic drive, & you have more than enough time to explore the falls & bear sanctuary before returning. Visit the biggest in the Luang Prabang area in the utmost comfort with a shared minibus transfer. Get picked up directly from your hotel doorstep by a professional driver and head to the breathtaking Kuang Si Waterfall. Featuring three tiers leading to a 50 meter drop, the waterfall is a popular attraction among both tourists and locals. Change into your swimming clothes at one of the wooden huts by the entrance and enjoy a relaxing swim in the cool azure pools of the waterfall before heading downstream. Bathe with a backdrop of lush tropical jungle and enjoy the cooling shade of the green trees. You can also explore the trails leading to the top of the stream and see more natural pools. After your exciting day get back on the minibus for a drop off in the city center. 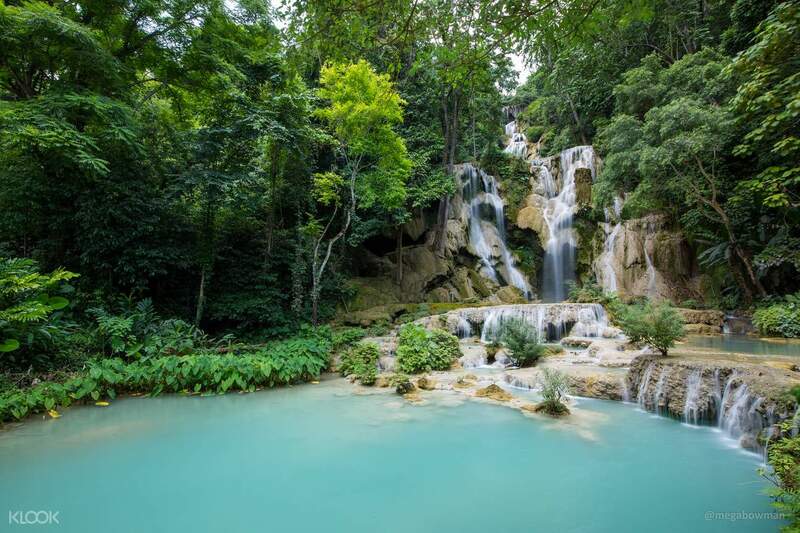 Never leave Luang Prabang without visiting this waterfall. The shared minibus service certainly makes it easy to visit Kuang Si. Pick up and drop off are on schedule. 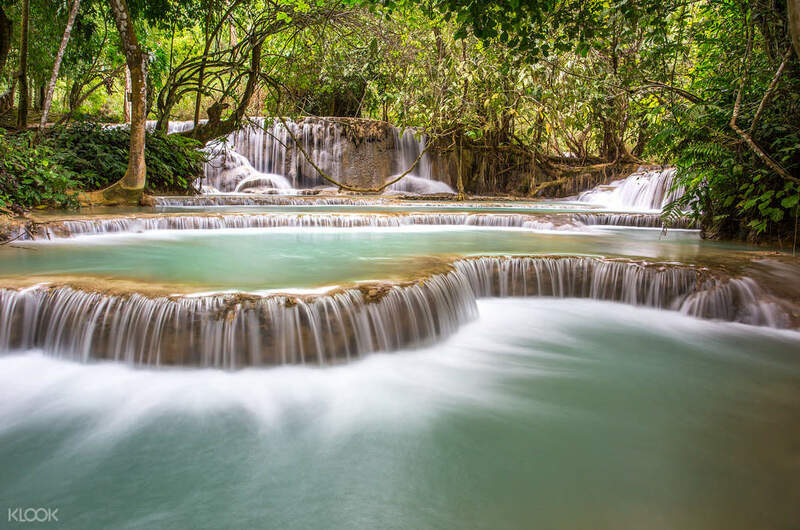 Never leave Luang Prabang without visiting this waterfall. The shared minibus service certainly makes it easy to visit Kuang Si. Pick up and drop off are on schedule. The van did pick us up on-time and did arrive on time. We did have about 2 hours on the place to explore the bear sanctuary and the falls (which was very nice). The van did pick us up on-time and did arrive on time. We did have about 2 hours on the place to explore the bear sanctuary and the falls (which was very nice). It is what it is. I was lucky I got to sit up front. The pick-up time is 15 mins before or after the stated pick-up time. My pick-up time was 1:30 so the late email said 1:15-1:45. I got picked up around 1:47. Good enough for asia. You still have to pay 20000 kip when you get there for entrance to the waterfalls. It is what it is. I was lucky I got to sit up front. The pick-up time is 15 mins before or after the stated pick-up time. My pick-up time was 1:30 so the late email said 1:15-1:45. I got picked up around 1:47. Good enough for asia. You still have to pay 20000 kip when you get there for entrance to the waterfalls. I was picked 10 minutes early from my hostel at 11.20am and continued picking others that booked the same tour. The drive was 45 minutes, and we arrived at the entrance of the falls at 12.41pm. The driver informed everyone to return by 3.00pm, and it is important you do so. We had two or three people who we had to leave at the falls before making our way back to the city, because we could find them even at 3.15pm. I suggest you set a phone alarm to 2.45pm unless you intend to take a swim. All of us were dropped back at the city center by about 4.05pm. I was picked 10 minutes early from my hostel at 11.20am and continued picking others that booked the same tour. The drive was 45 minutes, and we arrived at the entrance of the falls at 12.41pm. The driver informed everyone to return by 3.00pm, and it is important you do so. We had two or three people who we had to leave at the falls before making our way back to the city, because we could find them even at 3.15pm. I suggest you set a phone alarm to 2.45pm unless you intend to take a swim. All of us were dropped back at the city center by about 4.05pm. Driver was on time to pick us up, but late in the return trip: we were supposed to leave Kuang Si at 15h but we only left at almost 15.30h. Besides this, everything else was okay. The waterfall is amazing and totally worth the visit. Driver was on time to pick us up, but late in the return trip: we were supposed to leave Kuang Si at 15h but we only left at almost 15.30h. Besides this, everything else was okay. The waterfall is amazing and totally worth the visit. The driver not late to pick up me. The van is comfortable although this trip will sharing tour. The driver not late to pick up me. The van is comfortable although this trip will sharing tour. Pick-up on time and gave us enough time to spend around waterfalls. This is a must visit when in Luang Prabang and it's very convenient for a solo traveller that they offer a minivan to go their without spending so much. There's a 20,000 Kip entrance to waterfalls. Pick-up on time and gave us enough time to spend around waterfalls. This is a must visit when in Luang Prabang and it's very convenient for a solo traveller that they offer a minivan to go their without spending so much. There's a 20,000 Kip entrance to waterfalls. It was a marvelous trip. The road is quite uneven but it is safe if you were to take a minivan. The driver was punctual on picking up us at the hotel. Although there was a little confusion on which van to take, but it was solved with the guidance of the other driver. The driver of mini van 5725 is very careful and friendly. It was a marvelous trip. The road is quite uneven but it is safe if you were to take a minivan. The driver was punctual on picking up us at the hotel. Although there was a little confusion on which van to take, but it was solved with the guidance of the other driver. The driver of mini van 5725 is very careful and friendly.